Hey everyone, I know you guys have being asking for high resolution images of the new War Hero PvP gear ever since you saw those previews I posted. Thankfully, in addition to purchasing them via ranked Warzone Commendations, you can also craft these as empty orange shells! This took me a couple days as I had to level a synthweaver on the PTS. Luckily my alt, who also got transferred (by mistake hehe) is an armormech so I didn’t had to level an armormech as well. Hey everyone, guild banks and vehicle achievements (achievements that grant you vehicles) are two of the smaller features coming to 1.2. Since they are both relatively small features, I have decided to clump them together and write about both at once! Endgame crafting mats and space missions in 1.2! Hey everyone! 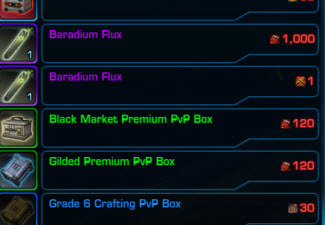 Patch 1.2 has finally made a lot of the endgame exotic crafting materials (Alien Data Cube, Biometric Crystal Alloy, Self-Perpetuating Power Cell and Rakata Energy Node) tradeable and also added an entirely new list of crafting materials (Molecular Stabilizer, Synthetic Energy Matrix, Baradium Flux). What is neat is that you can also obtain these materials via methods other than raiding, like doing space missions! Updated: April 9 – Added Black Hole commendation drop rate from Hardmode EC and two new “variants” of Black Hole gear. Hey everyone, with the upcoming release of 1.2, there will be two new PvE endgame armor sets to “grind” for. One is the Black Hole MK-1 armor set which can be purchased via Black Hole Commendations that drops from Nightmare Karagga’s Palace, storymode/hardmode Explosive Conflict, and Corellia Black Hole weekly. The other is the Campaign set whose tokens drops from hardmode Explosive Conflict bosses. Hardmode EC bosses/chests also drops Black Hole MK-2, MK-3 pieces directly (i.e. you get the specific armor pieces, not tokens). Hey everyone, one of the major features that is coming up in patch 1.2 is the Legacy system! For those not knowing what the Legacy system is, it is essentially a set of levels that every character in your account on the same server can contribute towards to. More Legacy levels will unlock cool new rewards. Think of it as a way to reward you for playing your alts! The Legacy system is cross-faction, so that means both your Empire and Republic characters are part of it. Unfortunately, the Legacy system are a per-server basis only – so that means your characters on other servers will not be part of the Legacy family you have on another server. With no server transfer in place anytime soon, this is certainly a huge bummer for people with multiple characters on multiple servers. Hey everyone, with the coming of patch 1.2 in early April and the arrival of ranked Warzones, there has being a huge surge of interest in PvP. For many people who are not avid PvPers or keep up with the latest development on the Public Test Server (PTS), it can be confusing to know the PvP gearing changes in 1.2. This guide hopes to demystify all that and provide you with a comprehensive overview of the PvP gearing process in 1.2 and detailed stat comparisons between different PvP sets. Hey everyone, your old Champion/Battlemaster/Centurion are no longer being used in patch 1.2. They do not disappear, you just can’t use them to purchase armor anymore (they are no longer obtainable either). So the question is – what are they being used for now? Are you one of those people farming orange bracers/belts for your characters? 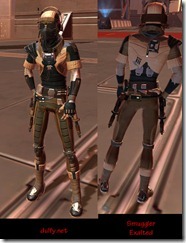 Or maybe you are a marauder/sentinel and wondering why there isn’t any orange bacers/belts for you! Have no fear! Legacy vendors are coming in 1.2 and they will solve all your problems! (ok maybe not all).